Yahoo! annouced the sale of the Delicious bookmarking service to AVOS, which means all those bookmarks you archived will soon have a new home. You can transition your Delicious account to the AVOS version, but you might want to consider making a backup copy before you do. I moved all my Delicious bookmarks to Pinboard, but also wanted to make a personal archive. If you want to archive all the bookmarks and tags you accumulated over the years, Evernote is one of the best places to export your Delicious bookmarks. Thankfully Evernote makes it easy to import them with a tool that grabs your Delicious bookmarks and imports them, along with tags and the timestamp of when you created them. The native Delicious export to Evernote is better than any of the hacks I found online, which all use the webclipping plugin to import all your bookmarks in a single note. 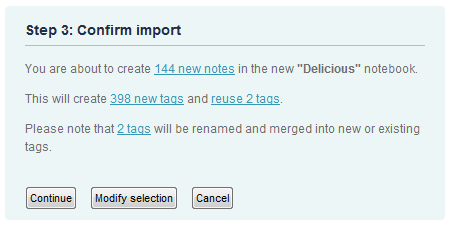 By importing Delicious bookmarks into Evernote, you get options. 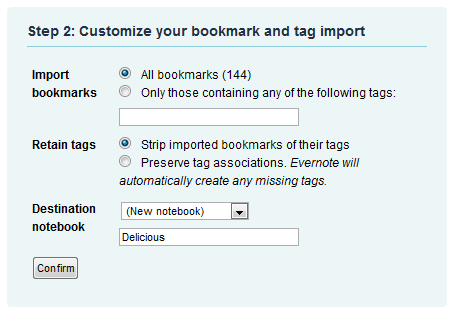 To get started importing your Delicious bookmarks to Evernote, go to the Delicious Import page. From there, you will be promted to sign in to your Delicious account. You need to use the Delicious username and password, not your Yahoo! account. Exporting bookmarks from Delicious provides several options. You can export everything, which I recommend, or you can only export a subset of your bookmarks. You can bring all your tags with you, which gives you more data to search in Evernote, but may take longer than simply importing the links. And finally you can choose which notebook to store your data in, which defaults to Delicious. After you choose what you want to move from Delicious to Evernote, you will be promted to confirm what you are importing. This is handy because you won't want to import twice and end up with duplicates, or inadvertently import the wrong stuff. The import process varies in time depending on how many bookmarks you have. Once import is complete, you can browse and search your Delicious bookmarks in Evernote. You have until July 2011 to continue using Delicious in its current form. While I have some reservations about the new Delicious terms of service, I do think it's good for the Web to also transfer your bookmarks to the new Delicious, even if you never use the site again.